This is where you’ll find this book! I’ve just finished this title, the debut novel from Sallyann and I have to say that I found it utterly enthralling. As a first time effort at publishing a work, Sallyann has set a very high bar in her ability to tell a good story that keeps the reader on edge, waiting and willing the pages to turn to see what happens next. The story charts the life of Tavi (Octavia) a young woman finding her feet in both human and werewolf form, learning to trust when she thought it no longer existed, finding family when her own family is viscously taken away from her. 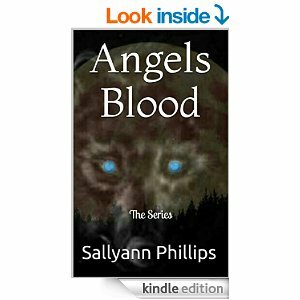 The story is compelling and Tavi’s vulnerability ever present, until she unleashes her lethal other side. Sallyann’s description of each scene has you right there beside Tavi, struggling to decide what to do and learning to lean on comparative strangers. The werewolf genre isn’t one I’d normally choose so to pick this up and get into it as I have done was a little breathtaking, and I’ll be eagerly awaiting the sequel to the unfinished business of the first book. I’d recommend this to anyone who likes the genre, or indeed anyone wanting something that flows as a story. I rated it 5 well deserved stars. Thank you Ian, I can’t believe you did this, but trust me when I say I really appreciate it along with all the help and support you been so graciously afforded me to date.